This vegan fried rice will satisfy your craving for Chinese food without making you overload on carbs! Loaded with veggies and fresh ginger, this dish will quickly become a family favorite that’s ready in 30-minutes! Vegan & Gluten-free. The last week has been a doozy for us. It’s been jam-packed with all things wedding. We’ve had two design meetings with our planner to work on creating our wedding theme, we had the menu tasting meeting, and next up is the cake tasting. Along with working on the seating chart, picking out the invitations and planning when I’m going to go look for my dress, I’m pooped. Needless to say, I wanted a quick easy dinner this week so I wouldn’t have to spend hours in the kitchen. A few weeks ago, I watched a recipe made on thefeedfeed Snapchat by Courtney, from RealFoodology, that showed how to easily make cauliflower fried rice! I love vegan fried rice. It’s one of my favorite cheat foods. I was sure that is wouldn’t taste the same, and I was shocked at how easily and quickly she made it. I had to try it. Fun fact— Did you know that the rice in fried rice isn’t actually fried? In traditional Chinese cooking, the rice is stir-fried which resulted in calling the dish fried rice! 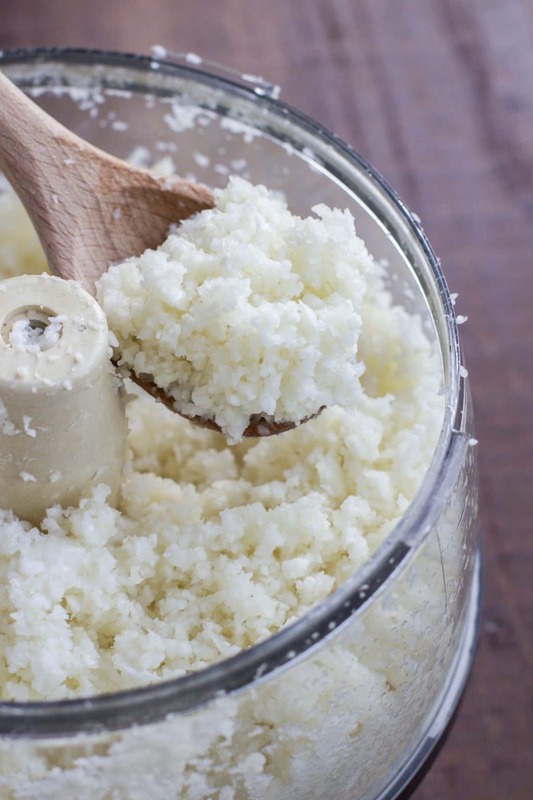 I’ve heard of cauliflower rice before but I naturally assumed that it would be time-consuming and difficult to make. It’s been on my list to try but I didn’t think I had the time to make it. I was so wrong! It’s so easy to make. Just another reason why I believe that cauliflower is magical! That’s it! Seriously, so easy. Vegan fried rice tastes like a mix of rice and quinoa to me. It’s delicious! I gave it to Travis for dinner without telling him what it was and he had no idea that it wasn’t rice! He loved it too. The biggest test was getting my dad to try it. He likes vegetables but he’s not really into all the new healthy food trends. My mom just recently got him to try avocado toast. It’s been a struggle. He loved it too! I sent some plain cauliflower rice over to my parent’s house and my mom cooked it with fresh pesto sauce and served it with sockeye salmon. My dad had three helpings of cauliflower rice with his dinner! Success! If my picky dad loved it than I know everyone will! Want more riced cauliflower recipes? Try these! Related Vegan Cauliflower Recipes You Might Enjoy! I’ve made this vegan fried rice three times this month! It’s so easy and it’s the perfect healthy choice for dinner when you have no extra time to spend in the kitchen. It tastes like Chinese food takeout but it’s actually healthy and good for you! You can make the cauliflower rice yourself or use frozen cauliflower fried rice to make it easier on yourself! Use a mix of frozen vegetables (broccoli, rice, and carrots) to save even more time. Don’t skip the fresh garnish, it adds so much flavor! Double the recipe so you’ll have leftovers for easy lunches all week! Add baked tofu or tempeh for an extra boost of plant-based protein! 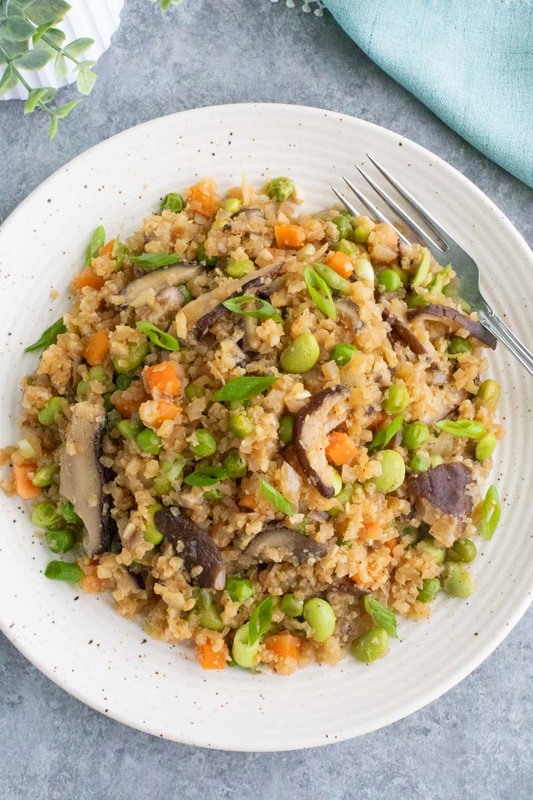 One of my favorite shortcuts to make this vegan cauliflower fried rice in a snap is to use frozen veggies. You can substitute any vegetables you like but I mainly use frozen broccoli florets, sliced carrots, and edamame. The broccoli comes out perfect every time! Ginger cauliflower fried rice will satisfy your craving for Chinese food without making you overload on carbs! Loaded with veggies and fresh ginger, this dish will quickly become a family favorite! Vegetarian. 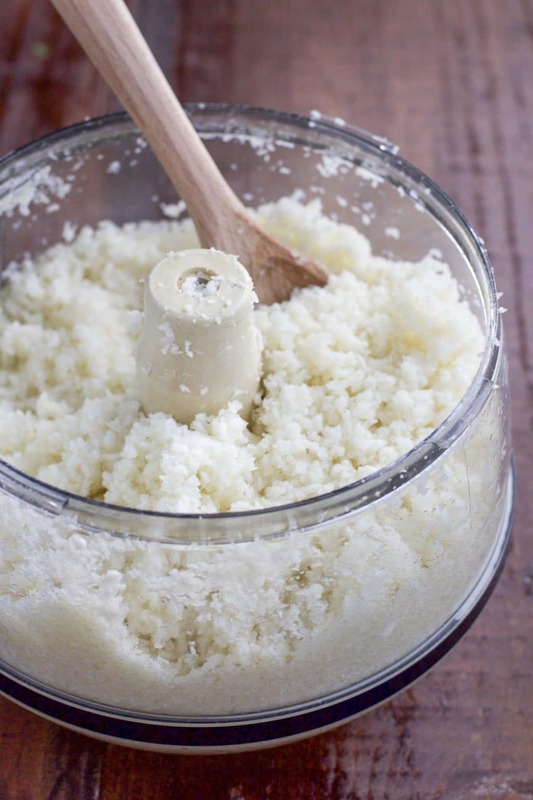 Cut the cauliflower florets off and put them into the food processor and pulse on high until it resembles small rice grains. Set aside. Saute the diced onions in coconut oil in a large pan over medium heat until softened. Add the frozen broccoli, carrot sticks and water. Cover and let the water steam the vegetables until soft. Remove the lid and push the veggies to one side of the pan. Add the cauliflower rice, fresh ginger, and tamari to the other side of the pan. Stir to combine. Cook for 5 minutes or until cauliflower rice is cooked through. Season with pepper. Garnish with cilantro and green onions. What are your favorite vegan cauliflower meals or recipes with riced cauliflower? I’d love to try it! Let me know in the comments!